If you have noticed your teeth just don’t look as bright or as white as they once did, you will most likely be able to track down the culprit in your lifestyle. What you eat, drink and do every day can have a profound effect on your teeth and leave them looking yellow or even brown over time. Our West Hollywood cosmetic dentist, Poneh Ghasri DDS, can offer you several teeth whitening solutions, but once you know how your habits affect your teeth, you can take steps to keep them always looking their best. Any foods that are deeply colored, such as curries, berries or tomato sauces, are likely to stain your teeth. One rule of thumb is that if the food can stain cloth, it can also stain your teeth. Drinks are one of the most common culprits of stained teeth. Coffee, tea, colas and wine are some of the worst offenders. Hot drinks can open the pores of your teeth and deposit stains deep within while acidic drinks can deposit stains and wear away enamel. Smoking may be the worst offender on the list. Just as nicotine stains fingers and cloth, it also stains teeth and leaves them dark yellow or even brown. Only professional whitening treatments can remove some of these stains. More than four million people have used Zoom’s in-office whitening treatment, which whitens teeth by as much as eight shades in just an hour. Zoom WhiteSpeed combines a high-strength whitening formula with a special light in order to maximize whitening results. 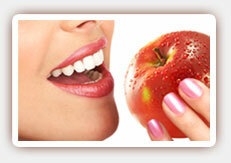 Contact Dr. Ghasri, West Hollywood Zoom whitening expert, today to learn more or to schedule your consultation.